For World Down Syndrome Day 2019, we focussed on local awareness and we teamed up with Pontefract Junior Parkrun. It was a fantastic (if a bit chilly!) morning, with over 150 children and young people attending the run. Our mascot Superstar was in attendance, warming up and running alongside our families. 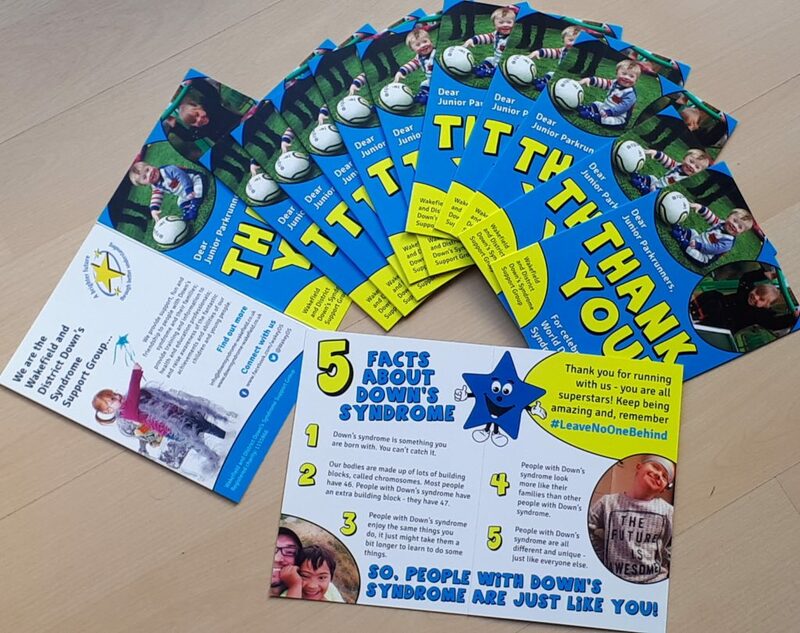 We gave out goody bags to all of the participants, with medals and WDDSSG wristbands, and treats donated by Morrisons, along with a very special thank you card from us. The World Down Syndrome Day theme for 2019 was ‘Leave No One Behind’ and that fits our thinking, and that of the Parkrun community perfectly. We wanted to show that children with Down’s syndrome are just like any other child, and can play an active and valuable part in their community. We’re really proud of the kids with Down’s syndrome who ran and walked the course, and those who volunteered at the finish line. To continue the message of Leave No One Behind, we created this wonderful video, celebrating our families and showing images and videos of togetherness. It was seen over 6000 times on social media, spreading awareness far and wide.